I’ve been anxiously waiting to post this project! I’ve been on pins & needles ever since a friend told me that he was expecting a baby girl that was due in a few weeks! Well the day finally came, and a sweet little baby girl was born today! I made this card the day he told me it was a girl. Now I can finally give it to him, and show you. Baby Bear is the stamp set that I used to make this realistic, life-like stuffed animal bear. A triple stamp, I used Sahara Sand, Crumb Cake and Early Espresso ink for each layer of the bear to create that realistic effect. My paper is Flirty Flamingo card stock for the card base, with a Crumb Cake layer. Flirty Flamingo DSP and another layer of Flirty Flamingo cardstock with a Whisper White image panel. The sentiments were stamped in Early Espresso ink on Crumb cake banners. A row of pearls and a bakers twine bow adorn this card. Any time I used a card base other than Whisper White or Very Vanilla, I like to make an inside panel to write on. 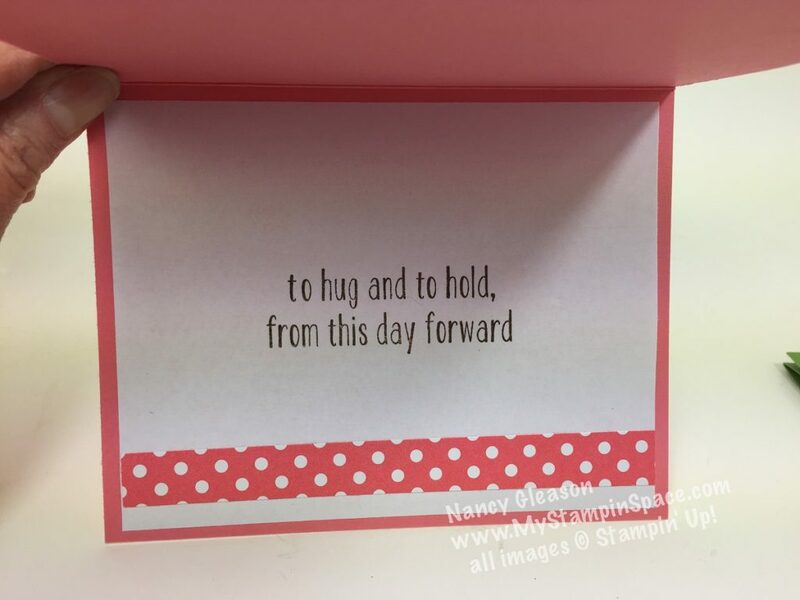 My inside also contains another sentiment, with just enough white space to include a handwritten note. I used another strip of DSP so the inside and the outside coordinate. And I just LOVE this sentiment! I’m so glad that my friend is a Dad with a precious little babe to love and to hold. 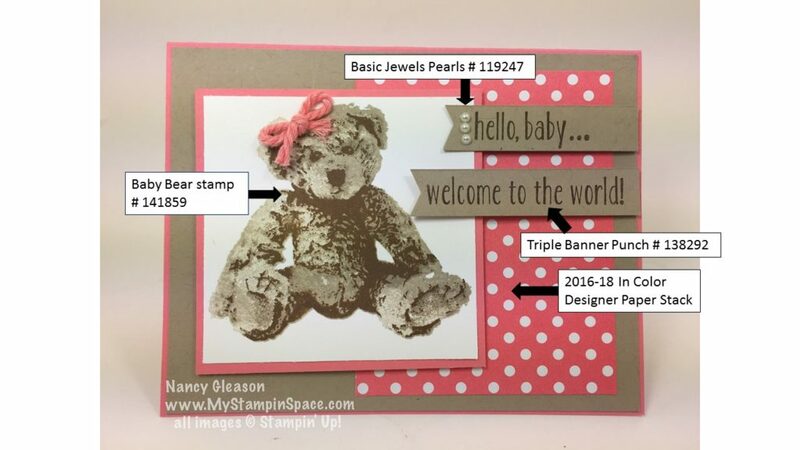 Baby Bear is such a versatile stamp set too! If you’d like to order any of the products I used, click here to shop my store. You can also click on any of the hi-lighted items in the description above. Please use January Host Code 2BUYMMWN when placing an order that is less thaln $150. When shopping, you’ll earn 1 Free Sale-A-Bration item for every $50 you spend (before shipping and sales tax). 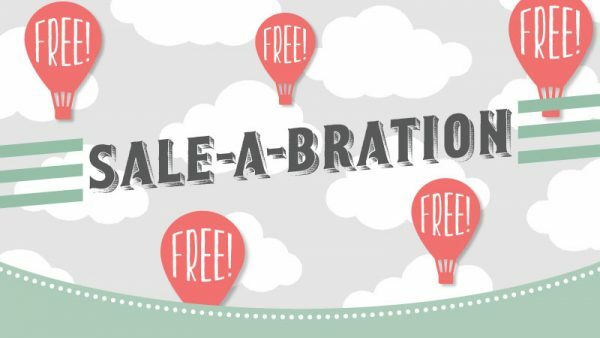 Want to learn more about Sale-A-Bration? Click here. 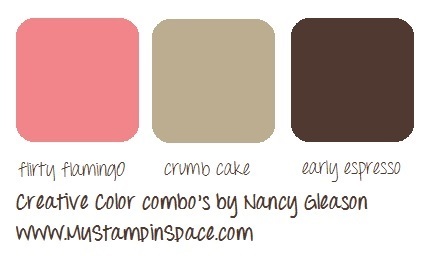 Thanks for stopping by My Stampin Space. 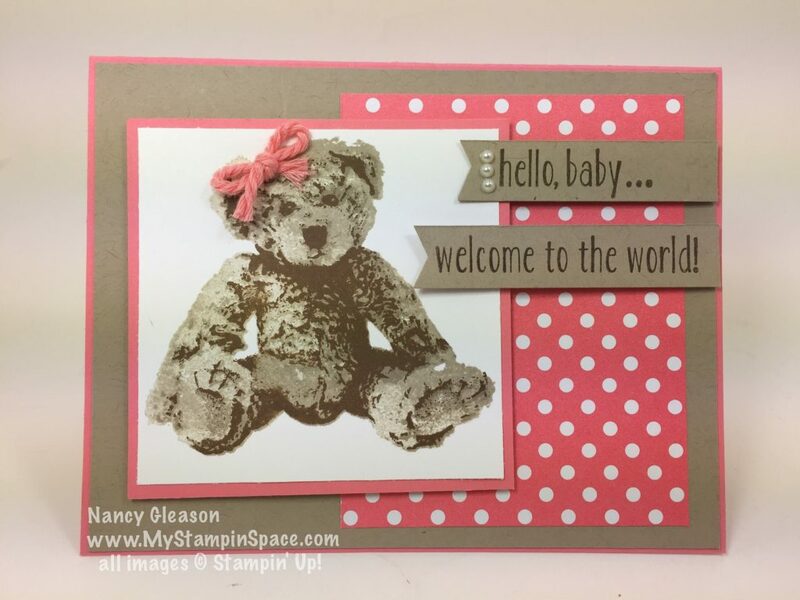 I hope I inspired you to use Baby Bear when you have a little one to welcome into the world! Share a pic to my Facebook page of any projects you made using Baby Bear. While you’re there, please like my Facebook page too so we can stay in touch there. I’m also on Pinterest and Instagram so follow me there as well! See you soon. First of all, Congratulations! I haven’t attempted a blog page yet. I want to grow my business, but, I’m truly afraid of the web. !